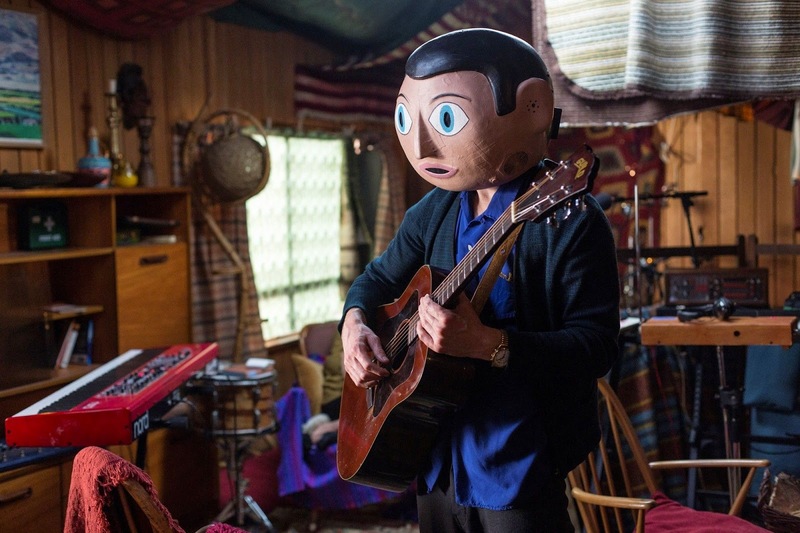 At the beginning of Lenny Abrahamson's self-proclaimed quirky indie Frank there is a series of scenes in which Jon (Domhnall Gleeson) attempts to come up with an idea for an original song. He stands, making observations, trying to put melody to descriptive words that paint a picture of what he is saying and deeper than this he is trying to find some type of depth, some kind of weight to what he is experiencing that might translate and be appreciated in song. The thing is, Jon isn't very good at capturing what his ambition tells him he is capable of. This is not only depressing and a slap in the face for anyone too self-conscious to believe they would actually ever make a good entertainer who really only wants to create music, but it is also a promising start to a film that offered insight into the mind of someone who creates what we all find catchy. Music, no matter the genre, is universally loved and related to-hell, it is looked to in order to heal scars, to uplift souls and to affirm our belief that there is something worth living for or that there is hope for the human race indeed. Music is a way of expressing what can't be felt through words alone by putting sound behind them that emphasizes the emotions intended. It seemed from the get-go that Frank would indeed cover the gamut of human emotion and investment involved in creating a collection of songs that represent something of meaning to those behind them and become significant to those who hear them and connect them with their lives. Instead, what the film turns out to be is a strange critique of the quest for fame and how that quest is flawed when recognition is the only goal rather than the simple satisfaction of creating art and basking in it. It is acceptability vs. eccentricity in Abrahamson's film and it is an interesting debate for sure, but ultimately you question our surrogates entire purpose for even continuing on this journey after realizing not only that Frank and his band mates are going nowhere fast, but also that they don't take him seriously. The following statement sounds shallow and close-minded yet I believe it can be rightly justified given the subject of critique here, but if there doesn't seem reason for our main character to take this journey-why should we? mesh as well as they probably should considering they're in a band together. As stated, Jon is a young wanna-be musician who goes about his ho-hum day with little more to look forward to than the dinner his mom cooks and living vicariously through his Twitter feed. On lunch break from his nine to five office job Jon witnesses a man trying to drown himself who happens to be the keyboardist for a band playing in his town that night. He opens up conversation with band member Don (Scoot McNairy) who offers him the replacement keyboardist position on the spot to which Jon accepts gleefully and without inquiry as he is simply thankful to take another step in the direction he'd like to see himself go. Playing the scheduled gig with the band that night with no rehearsal and no idea what their music sounds like Jon quickly realizes this isn't a band in the traditional sense of the word. The remaining members include Clara (Maggie Gyllenhaal) who has a firecracker of an attitude and a strong sense cynicism towards Jon and everything he stands for and aspires to be while Baraque (Francois Civil) and Nana (Carla Azar) more or less follow her lead with no questions asked. Jon leaves the set weary of his first experience collaborating with other musicians and the failed meshing of tastes he encountered only to hear from Don a few weeks later about becoming a permanent replacement for their keyboardist. From here, I expected the film to take us on a guided tour through life on tour with the ridiculously named Soronprfbs and how it would lead to Jon discovering something about his songwriting process and how he can incorporate the improvisational style of his new band that might ultimately culminate in something truly transcendent, but instead we are stuffed into a house with these oddballs and forced to slowly watch Jon discover he's bitten off more than he can chew as he acclimates himself with the mysterious and enigmatic lead-singer Frank. Frank presents a case of an interesting premise with ample opportunity to explore several different avenues of popular culture and the nature of celebrity and state of popular music yet I found it hard to accept given the titular character and his followers are trying so hard to be different that it becomes clear they don't care if we know or like them at all (this initial reaction gives way to more conversation and stands to reason as to why there is at least something interesting going on here). Regardless of whether we like them or they find fans, they are going to do things their way. Granted, here is another caveat of the film and its attitude in which conversation can be drawn from as in where the line can be drawn when it comes to conformity? No matter how artistic one wants or strives to be, all movies, music, etc. is made with an intent to turn some type of profit. That doesn't mean there can't be some type of artistic ambition or quality to the product, but naturally there is a need to support ones self at the very least so you can go on creating more of what you love. It is here that the connection is dropped between myself and the original members of Soronprfbs. It is this severance in philosophy that makes Frank more frustrating to watch than it probably should be. In reality, this is no more than that "quirky indie comedy" that it has been labeled it takes the most "indie" of bands and creates a feature-like documentary on the making of their latest album, but it certainly wants to be more than that. In that regard, as I watched this group of people essentially burn themselves to the ground I couldn't help but wonder why Jon wouldn't get himself out of such a situation. For Jon, despite his legitimacy as a songwriter, the struggle is real. He is in a constant state of the creative process so that every once in a while he might stumble upon a gem that stands out and exceeds everything else floating through his mind. That he clearly hasn't found a match in those that share his ambition should signal the story go in a different direction, but rather Jon sticks around putting everything he has into what we (and he should) realize is a sinking ship. Frank plucks his guitar as he and the rest of Soronprfbs record their album. What is probably the most fascinating aspect of Frank though is what it tries to do in regards to its titular character. It is interesting that he is not the main character in a film titled after him, but more a very low-key secondary player that stands out solely because of the pre-ordained importance placed on him being the lead singer (and also because he wears a huge paper mache head). Regardless of the fact Jon is our surrogate, Frank is clearly the more interesting entity here and in that being an almost indisputable fact we are as drawn into the mystery and the mythic air of legend around where this man has been and where he is going. 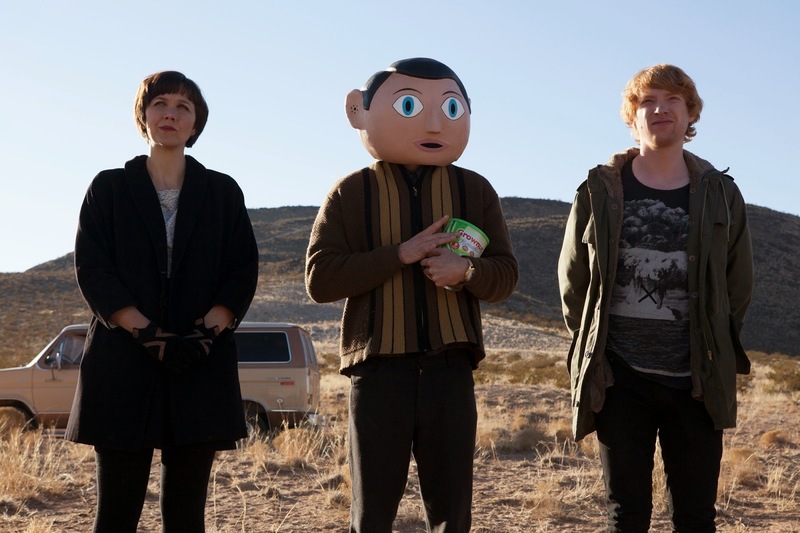 It is not that Frank is a bad film because we dislike the characters, they are indeed very interesting and layered, but it is the circumstances and the way these situations play out that are more disappointing than anything else. As I said in the beginning I was immediately taken with the plight of Jon, what he was trying to do with his music and how Abrahamson might further display the process of creating music on screen-the same of which can be said about the first time we meet Frank. We don't get it, but we wonder why he is doing what he's doing and even further if it is intentionally trying to push the boundaries of strange or if this is simply him making a statement, not that far removed from the norm. Is this a man simply walking a fine line between genius and insanity or is he swaying so far in one direction us common folk are unable to perceive which category he falls in? On these levels the film produces interesting jumping off points for conversation about the ultimate goal Frank is trying to achieve by locking his band mates in a cabin for a year without producing a single, solid song. Does Frank even understand his own end-game? Is there an end-game or does he simply want to consistently create? 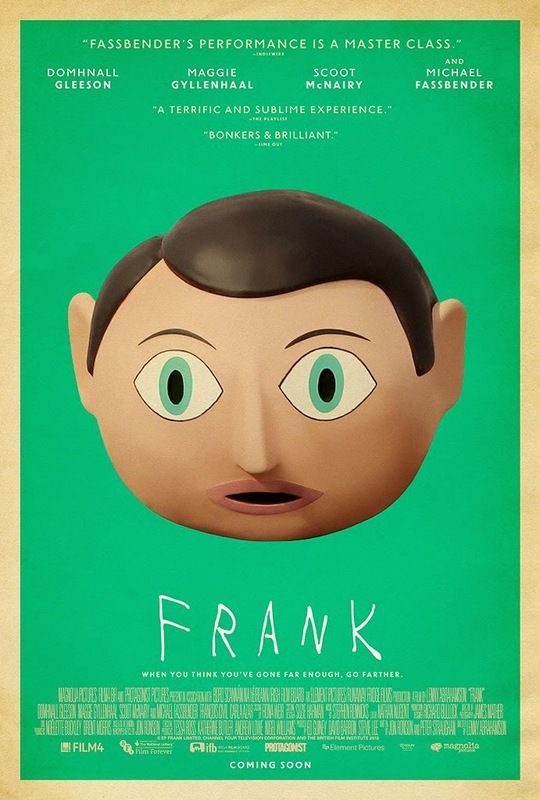 Though we never really uncover Frank's position on things or come to terms with what might have been the point he was trying to make this film that takes his name at least asks a few interesting questions with its characters while taking them on a less than substantial journey.